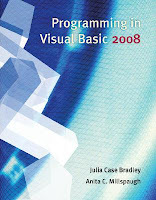 Julia Case Bradley and Anita Millspaugh are authors of the book Programming in Visual Basic 2008. Julia Case Bradley is professor at Mt. San Antonio College. He teaches courses in introductory and advanced Visual Basic, Access programming, and Microsoft Office in the department of Computer Information Systems. She began writing BASIC textbooks in 1984 using MS-​​BASIC (GW-BASIC), and has authored or co-authored texts in Macintosh Basic, QuickBasic, QBasic, Visual Basic, Internet, and desktop publishing using PageMaker, Ventura Publisher, and Publish It . Anita Millspaugh teaches programming courses in Visual Basic, C#, and Java at Mt. San Antonio College and has served as chair of the department for eight years. She received her MBA from California State Polytechnic University, with a bachelor’s degree in Computer Information Systems. She has taught faculty at the National Computer Educator’s Institute and also has led Great Teacher’s Conferences for Mt. SAC and for California Vocational Faculty. Visual Basic 2008 is an object-oriented programming language that includes inheritance and polymorphis. This book provides an understanding of the basic concepts of programming, problem solving, logic programming, and engineering design of an object-oriented language. Chapter in this book presents topics in a sequence that allows the programmer to study a visual interface to gain the ability to create projects with the object, decision, looping, and data processing. This book is intended as an introduction to the use of programming that assumes no prior knowledge of computer programming. This book provides guidance for professional programmers who are trying to learn a new programming language to enhance their capabilities. What knowledge is needed to study this book? This book is aimed at people who are familiar with the Windows operating system and can use the internet browser application. What will you learn with this book? Chapter 1, “Introduction to Visual Basic 2008,” introduces Microsoft’s Visual Studio integrated development environment (IDE). The single environment is used for multiple programming languages. A stepby- step program gets students into programming very quickly (quicker than most books). The PrintForm control is included to allow students to easily submit screen captures of the form at run time. The chapter introduces the OOP concepts of objects, properties, methods, and events. The elements of debugging and using the Help system are also introduced. Chapter 2, “User Interface Design,” demonstrates techniques for good program design, including making the interface easy for users as well as guidelines for designing maintainable programs. Several controls are introduced, including text boxes, rich text boxes, masked text boxes, group boxes, check boxes, radio buttons, picture boxes, and the new Shape and Line controls. Chapter 3, “Variables, Constants, and Calculations,” presents the concepts of using data and declaring the data type. Students learn to follow standards to indicate the data type and scope of variables and constants and always to use Option Strict, which forces adherence to strong data typing. Error handling is accomplished using structured exception handling. The Try/Catch/Finally structure is introduced in this chapter along with calculations. The student learns to display error messages using the MessageBox class and also learns about the OOP concept of overloaded constructors. Chapter 4, “Decisions and Conditions,” introduces taking alternate actions based on conditions formed with the relational and logical operators. This chapter uses the If statement to validate input data. Multiple decisions are handled with both nested If statements and the Select Case structure. The debugging features of the IDE are covered, including a step-bystep exercise that covers stepping through program statements and checking intermediate values during execution. Chapter 5, “Menus, Common Dialog Boxes, Sub Procedures, and Function Procedures,” covers the concepts of writing and calling general sub procedures and function procedures. Students learn to include both menus and context menus in projects, display the Windows common dialog boxes, and use the input provided by the user. Chapter 6, “Multiform Projects,” adds splash forms and About forms to a project. Summary data are presented on a separate form. The Friend keyword is introduced. Chapter 7, “Lists, Loops, and Printing,” incorporates list boxes and combo boxes into projects, providing the opportunity to discuss looping procedures and printing lists of information. Printing is accomplished in .NET using a graphics object and a callback event. The printing controls also include a Print Preview, which allows students and instructors to view output without actually printing it. Chapter 8, “Arrays,” introduces arrays, which follow logically from the lists covered in Chapter 7. Students learn to use single- and multidimension arrays, table lookups, and arrays of structures. Chapter 9, “Web Applications,” introduces Web applications using VB Web Forms. Students learn to design and develop simple Web applications that consist of Web pages that execute in a browser application. Multiple-page Web sites are covered along with validator controls and an introduction to state management. Chapter 10, “Database Applications,” introduces ADO.NET, which is Microsoft’s latest technology for accessing data in a database. This chapter shows how to create binding sources, table adapters, and datasets. Programs include accessing data from both Windows Forms and Web Forms. Students learn to bind data tables to a data grid and bind individual data fields to controls such as labels and text boxes. LINQ is used to query system processes. Chapter 11, “Data Files,” presents the VB object-oriented techniques for data file handling. Students learn to save and read small amounts of data using the My object and using streams. The StreamWriter and StreamReader objects are used to store and reload the contents of a combo box. Chapter 12, “OOP: Creating Object-Oriented Programs,” explains more of the theory of object-oriented programming. Although we have been using OOP concepts since Chapter 1, in this chapter students learn the terminology and application of OOP. Inheritance is covered for visual objects (forms) and for extending existing classes. The samples are kept simple enough for an introductory class. Chapter 13, “Graphics, Animation, Sound, and Drag-and- Drop,” covers the classes and methods of GDI+. The chapter covers graphics objects, pens, and brushes for drawing shapes and lines. Animation is accomplished using the Timer control and the SetBounds method for moving controls. My.Computer.Audio.Play is used to provide sound, and drag-and-drop events are used to transfer the contents of a text box to a list box and to move images. Chapter 14, “Additional Topics in Visual Basic,” introduces some advanced VB topics. This final chapter covers validating user input using Error Providers and the Validating event of controls. Students learn to create applications using multiple document interfaces (MDI), create toolbars and status bars using ToolStrip and StatusStrip controls, and add Web content to a Windows Form using the WebBrowser control. The code snippet feature is introduced. Reading and writing XML text files is covered using the new XML literals and using LINQ. An introduction to Windows Presentation Foundation (WPF) includes using WPF interoperability with a standard Windows Form and creating a WPF Form project. The Appendices offer important additional material. Appendix A holds the answers to all Feedback questions. Appendix B covers methods and functions for math, string handling, and date manipulation. In OOP style, most actions that were formerly done with functions are now accomplished with methods of the Math class and String class. Appendix C, on mastering the Visual Studio environment, is based on the .NET IDE and includes instructions for using snap lines for form design. Appendix D discusses security issues for both Windows and Web programming.